The United States Congress designated the Glacier Bay Wilderness (map) in 1980 and it now has a total of 2,664,876 acres. All of this wilderness is located in Alaska and is managed by the National Park Service. 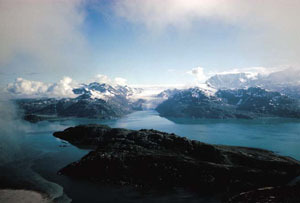 The Glacier Bay Wilderness is bordered by the Endicott River Wilderness to the east. The Wilderness of Glacier Bay National Park is forged from dynamic change in the wake of powerful seismic forces and dramatic glacial movements. Glaciers have sculpted this landscape, from the sharp brows of its mountain peaks to the deep troughs of its fjords. Even the land itself is rising as the colossal weight of the ice eases off of it. Here, it is almost as if the span of time has been condensed and then neatly unfurled across this landscape. It is a place renowned and protected for its diversity, constant change, and opportunity for study. Dramatic change and the ebb and flow of nature occur at every scale: within centuries, seasons, and hours. The tides swell and recede dramatically twice a day, oftentimes by as much as twenty vertical feet. Long days in the summer become markedly brief in the winter, as the earth’s axis slants away from the sun. Many species follow this pattern, disappearing from Glacier Bay during the winter, only to return or re-emerge in the spring. The salmon, a sustaining pillar of this ecosystem, return each year to the place of their birth to spawn, die, and dispense valuable proteins and other nutrients. Humpback whales converge on the rich feeding grounds in Glacier Bay in the summer, but in the winter range elsewhere to breed and give birth. People are also an inseparable part of this continuous cycle of disturbance and accommodation; the Tlingit have been here for centuries, and as the glaciers, rivers, and life have advanced and receded through the homeland, so have the clans and the Tlingit ancestors. Since its exploration by John Muir in 1879, scientists from around the world have been attracted to Glacier Bay’s living laboratory of pristine ecosystems dominated by natural successional processes. Visitors congregate in the warmer summer months to witness the calving of tidewater glaciers and contemplate change, resilience, and their connection to this dynamic landscape. The Glacier Bay Wilderness encompasses more than its namesake; the boundary extends along the Gulf of Alaska to the mouth of the glacial-fed Alsek Lake and areas surrounding the Chilkat and Fairweather Mountain Ranges. The alpine zone in the northern and western portions of the wilderness remain covered in ice fields, a diverse range of successional communities occupy recently ice-bound areas, and unglaciated refugia enfold the park’s outer coast and eastern edge. The outer coast is among the wildest coastlines in the world, and visitors there will be immersed in the purest wilderness imaginable. Glacier Bay National Park preserves one of the largest units of the national wilderness preservation system, encompassing glacially influenced marine, terrestrial, and freshwater ecosystems. Planning to Visit the Glacier Bay Wilderness? How to follow the seven standard Leave No Trace principles differs in different parts of the country (desert vs. Rocky Mountains). Click on any of the principles listed below to learn more about how they apply in the Glacier Bay Wilderness.